Belinda Hill, or "Lindy" as she is known, has been riding horses from a very tender age. Indeed, she was given her first foal at the age of one, and has spent a lifetime working with the animals. Her love and compassion for them prompted her to open Mauritius Horse Trails a year ago and thus far she has managed to rescue nine horses, giving them a new life at Riviere des Anguilles in the south of the country. The first of the lucky horses to be saved are named Swiss Avalanche, Dutori, Dawn Attack, Military Might, Simply Green, Orace Barfoot, Personal Choice, Arusha and Mystic Mount. They are mostly thoroughbred geldings and are former racehorses or show-jumpers, but they have been retrained and are now suitable for trail riding by both beginners and experts. They are looked after by six grooms, three of whom work full time and a programme which runs during the school holidays gives aspiring jockeys basic riding training and horse care lessons, in exchange for work as grooms. rock", is particularly pleasant with spectacular views of the ocean and the coastline. There are eleven different riding trails and up to seven people can be catered to at a time. The trips last between one and three hours and you will have the opportunity to learn riding skills such as how to sit, how to go up or downhill and what to do during a trot.As I was rolling along on Dawn Attack, trying to convince the horse not to eat the sugar cane growing along the side of trail, the historic and literal meanings of phrases like, "reign him in" and "champing at the bit" suddenly became abundantly clear! A variation on the trail rides is the "Barbecue Ride" which, as the name suggests, includes a barbecue or picnic lunch.These last for about three hours and you can choose from one of the following destinations; a rustic cabin called the "Refuge, Rochester Falls, which is a beautiful waterfall where you can swim in the river and Exil Lodge, situated at the top of a mountain overlooking Combo National Park and is more suitable for riders with at least intermediate ability. For those wanting riding lessons, Lindy offers something very different from the common teaching method of riding around an arena in circles Total beginners are lead by a lead rider while out on the trail, so that they do not need to control the horse themselves. This method allows the beginner to receive step by step instruction and concentrate on their seating and balance, as well as the opportunity to try gentle trots and canters on their first ride. 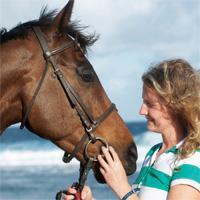 Lindy has taught many children to ride over the years, and Mauritius Horse Trails offers full-day clinics for them. Children simply love to learn about horses and the tranquil outdoor environment at Mauritius Horse Trails is the perfect setting for them to do so. Besides being taught to ride, they learn to tack-up, groom and feed the animals, as well as safety while riding, which is very important. Another project in the wings is riding holidays, which would consist of a number of days on a trail, with camping at night time and everything else that goes with it - if you imagine a scene from an old cowboy movie, minus the Stetsons, you'll get the idea. Of course the main goal of the company is to rescue as many horses as possible and in order to do this, it would require that those rescued be re-trained from being race horses, to becoming show jumpers or dressage horses and then rehomed.This would allow new horses to be taken in and the process repeated, but it is time consuming and expensive, requiring substantial investment, for it can take over a year to re-train a horse properly though thoroughbreds are generally very intelligent and nimble and can make very good competition horses. Mauritius Horse Trails is not just a business, it is a very worthwhile project and though it is still in its early stages of development there is plenty of potential and the people involved are very ambitious. They are also very friendly and riding a well trained horse and chatting to the person next to you can be quite fun and relaxing, I wouldn't call myself a horse person, but I have already been back for more and will no doubt go again. 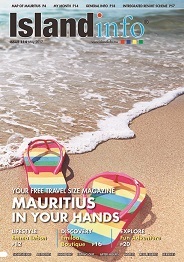 I can heartily recommend Horse Trails Mauritius as a great way to spend an afternoon, for novices or experts alike.